Earth had a climate long before we showed up and started noticing it and it's influenced by a whole series of cycles that have been churning along for hundreds of millions of years. In most cases those cycles will continue long after we're gone. A look at the history of climate change on Earth can give us some much needed perspective on our current climate dilemma because the surprising truth is, what we're experiencing now is different than anything this planet has encountered before. So, let's take a stroll down Climate History Lane and see if we can find some answers to a question that's been bugging Hank a lot lately - just how much hot water are we in? ... for various reasons. Rapid warming like we see today is unusual in the history of our planet. ... Earth's climate has been changing for billions of years. A wide range of evidence exists to allow climatologists to reconstruct the Earth's past climate. 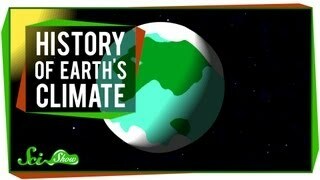 This evidence ... Earth's Climatic History.